At Drupa, the largest printing equipment exhibition in the world, DuPont Packaging Graphics originally featured it’s leading Flexo Plate Technologies. DuPont Packaging Graphics is one of the world’s leading suppliers of flexographic printing systems in digital and conventional formats. 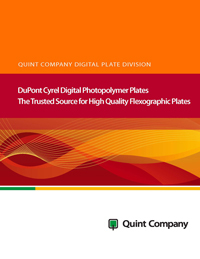 Following it’s own core principle of proactively meeting their customers’ needs, Quint took its next major, innovative step by introducing a Dupont Cyrel Photopolymer Plate maker with a fully digital workflow to their production line. Moving ahead continually and deliberately to insure the ongoing survival of the company and the best interests of their clients, Quint continues to stay at the forefront of Flexographic Plate technologies. – Tracy Lunt, global technology manager, DuPont Packaging Graphics.